October 12 is the 285th day of the year(286th in leap years) in the Gregorian calendar.There are 80 days remaining until the end of the year. 2005 – The second Chinese human spaceflight, Shenzhou 6 , is launched, carrying two cosmonauts in orbit for five days. 2017 – The United States announces its decision to withdraw from UNESCO. and is immediately followed by Israel. The year 539 BC was a year of the pre-Julian Roman calendar. In the Roman Empire, it was known as year 215 Ab urbe condita. The denomination 539 BC for this year has been used since the early medieval period, when the Anno Domini calendar era became the prevalent method in Europe for naming years. Year 633 (DCXXXIII) was a common year starting on Friday of the Julian calendar. The denomination 633 for this year has been used since the early medieval period, when the Anno Domini calendar era became the prevalent method in Europe for naming years. Year 1008 (MVIII) was a leap year starting on Thursday of the Julian calendar. Emperor Go-Ichijō was the 68th emperor of Japan, according to the traditional order of succession. Year 1240 (MCCXL) was a leap year starting on Sunday of the Julian calendar. Demosthenes was a Greek statesman and orator of ancient Athens. His orations constitute a significant expression of contemporary Athenian intellectual prowess and provide an insight into the politics and culture of ancient Greece during the 4th century BC. 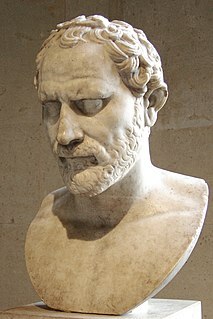 Demosthenes learned rhetoric by studying the speeches of previous great orators. He delivered his first judicial speeches at the age of 20, in which he argued effectively to gain from his guardians what was left of his inheritance. For a time, Demosthenes made his living as a professional speech-writer (logographer) and a lawyer, writing speeches for use in private legal suits. Year 638 (DCXXXVIII) was a common year starting on Thursday of the Julian calendar. The denomination 638 for this year has been used since the early medieval period, when the Anno Domini calendar era became the prevalent method in Europe for naming years. Elizabeth Fry was an English prison reformer, social reformer and, as a Quaker, a Christian philanthropist. She has often been referred to as the "angel of prisons". Saint Fiacc was a poet, the chief bishop of Leinster, and founder of two churches. Blessed Louis Brisson was a French Roman Catholic priest and the founder of both the Oblate Sisters of Saint Francis de Sales and the Oblates of Saint Francis de Sales. He founded the female branch alongside Saint Léonie Aviat and the male branch alongside the Servant of God Thérèse Chappuis. Brisson's founding of the orders stemmed from his desire to improve the working conditions of middle-class girls and to ensure their protection and the promotion of their faith. Edith Louisa Cavell was a British nurse. She is celebrated for saving the lives of soldiers from both sides without discrimination and in helping some 200 Triple Entente soldiers escape from German-occupied Belgium during the First World War, for which she was arrested. She was accused of treason, found guilty by a court-martial and sentenced to death. Despite international pressure for mercy, she was shot by a German firing squad. Her execution received worldwide condemnation and extensive press coverage. ↑ "The United States Withdraws From UNESCO". U.S. Department of State. Retrieved 2017-10-17. ↑ "Kamini Roy's 82nd death anniversary today". www.observerbd.com. Retrieved 2019-02-24. Wikimedia Commons has media related to October 12 .